In the last stop on the blog tour, Jo-Anne Berthelsen talks about how she came to write ‘Revelation’ for Glimpses of Light. It is a beautiful story, all the more special as it drawn from real events. Jo-Anne loves communicating through both the written and spoken word. She is the author of six published novels and one non-fiction work, Soul Friend: The story of a shared spiritual journey. 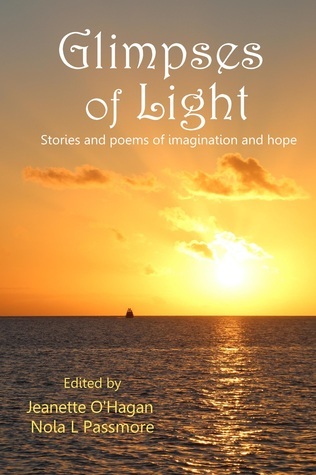 Glimpses of Light started with a flash of inspiration – why not write a collaborative charity anthology to celebrate the 2015 International Year of Light. It has been exciting watching that small kernel blossom into a book. Both Nola and I were thrilled at the number and quality of entries we received, the enthusiasm of our contributors and the willingness to work with us during the different stages of editing, proofing and publishing. I love each of the stories, poems and reflective pieces. Ruhanna sighed and began to step backwards when the carving of an albatross on a box, half covered by a goatshair scarf, caught the honey-hued rays of sunlight. She picked it up and slid open the beautifully fitted lid. Inside, on soft fabric, was an intricately carved pen of whale bone, inking stone and fine metal nibs. They spent the next few minutes haggling. Ruhanna shook her head, regretting her impulsive enthusiasm. Favula was hard to beat down. ‘As you wish, fifteen Royals, but you drive a hard bargain. That’s most of my savings.’ But it was for her father. It was worth it. Her feet felt like dancing. He was coming from the Big Island tomorrow. Ruhanna’s heart began to thump. She moistened her suddenly dry mouth. ‘I don’t know what you mean. Father is Royal Minister of Shipping and Mines and a loyal subject to the Sea Dragon Throne.’ She tried to pull her arm free, but the old woman’s grip was surprisingly strong. ‘The winds are changing. Best be careful, child.’ Favula laid a roughened finger beside her nose, her mouth stretched wide in a gap-toothed smile. She released Ruhanna’s arm and chuckled. The sun had already disappeared behind the hump in the middle of the island, bleeding the sky with oranges, reds and purples. Beyond the dock the waves of the strait stretched out in a bloody reflection of the sky. The guards were looking her way. Ruhanna drew her cloak around her, thankful for its warmth against a sudden gust of the wind. She gripped the gift she had selected for Baba and followed Zobar, ignoring the intense gaze of the Royal Guards. I’m offering a chance to win a print copy of Like a Girl anthology to the best answer on what’s your favourite genre and why. And one extra chance to win your choice of either Another Time Another Place OR Let the Sea Roar if you sign up to my email Newsletter – to keep in touch with future publications and news. Sci-fi author, Adam Colling’s is hosting the next stop on the blog tour. Adam has recently published his novella ‘Lynessa’s Curse’ – set in a futuristic medieval Mars. He draws inspiration from his over-active imagination, life experiences and faith and is currently writing a space opera series set in the same universe as his GOL story, ‘A Light To My Path’. Adam discusses books, movies and computer games on his YouTube show: Stories with Adam Collings. Less than three days before the Goodreads Giveaway of Glimpses of Light ends. Giveaway ends January 10, 2016.